With the exception of an 18-month stint in North Carolina, Marlyn Johnson has spent the better part of 70 years calling Menlo Park her home. She arrived with her family — her maiden name was Ahlenius — in 1943 to a small town of 5,000 that had not yet experienced the influx of citizens that the post-World War II years would bring. It was the construction of the short-lived Dibble General Hospital, built to care for soldiers injured in the South Pacific during the War, that brought her family to California from Minnesota. “My Dad helped build the hospital, and some of those buildings are still in use at SRI International today,” Marlyn says. Between 1943 and 1946, Dibble specialized in plastic surgery, blind care, neuro-psychiatry and orthopedics. At its peak it had 2,400 beds, about two-thirds the population of the entire town, according to the California State Military Museum. Upon arrival, her family rented a small bungalow that would eventually become the Peninsula Volunteer’s very first Little House Activity Center for only $35 per month. The house was located on Menlo Avenue. She later moved to another location near today’s Little House, where she resides today. Over the course of her years, Marlyn has seen many changes in Menlo Park that have allowed the town to expand into the bustling community that it is today. When she first arrived, the town library, police station, jail and City Hall were all housed in the same building on El Camino Real, close to Bruce’s Five & Dime, a dime store that actually abided by its name. During her youth, she was witness to the first summer baseball league, which got its start at Nealon Park courtesy of the likes of Hall of Famer Ty Cobb (who’d moved to Atherton in his post-playing days), Jim Nealon, Larry Johnston and Paul Melvin. (Melvin’s grandson is current Oakland A’s Manager Bob Melvin, a graduate of Menlo-Atherton High School). Unfortunately, no one can locate the prized Ty Cobb trophy from the final game that summer. 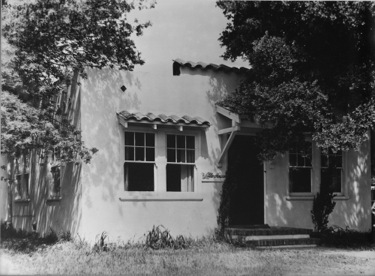 The original Little House (shown in photo above) was located at 630 Menlo Avenue on the western corner with Doyle Drive. The building on the lot today is Su Hong Takeout: same address but entrance on Doyle. The Pierce Directories show this address occupied by the Ahlenius family in 1949-53, and by a Dr. Stevenson (an eye doctor?) in 1953-55. The house must have been demolished soon thereafter when the downtown area renewed itself under Mayor Burgess.